In 2006 London’s foremost DJ and producer Hannah Holland started Batty Bass, the club night, as a vehicle to pursue the more eclectic side of her musical repertoire alongside long-time collaborator and friend Mama. Batty Bass subsequently manifested itself as a label in 2008, showcasing the incredible artists that have graced the stage of the club. Batty Bass has since become something of a monster. Continuously mobbed bi-monthly parties at The Star of Bethnal Green described by Time Out as “one of London’s finest clubs… a must-do on the UK’s club calendar”, have also given rise to a second residency at XOYO and special events in Berlin, showcasing the live side to the night and the label on a larger scale. 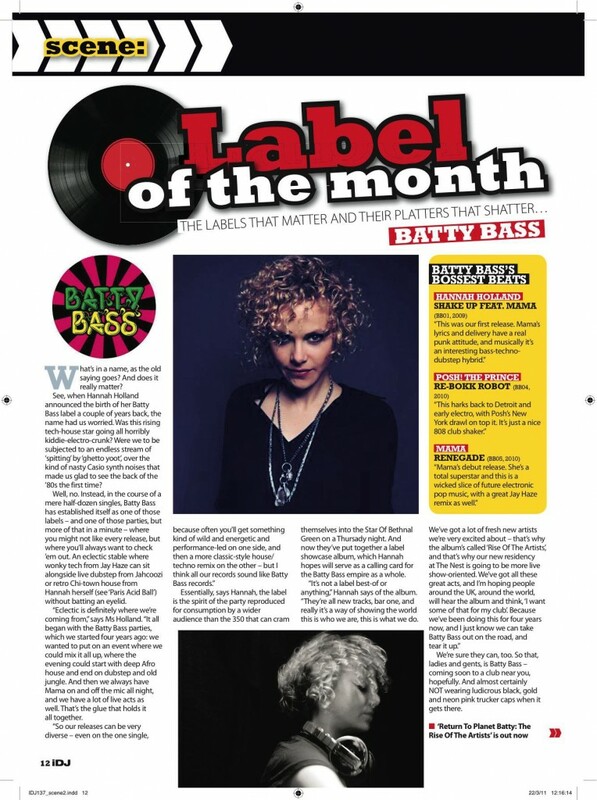 Batty Bass, the record label – iDJ’s label of the month back in March this year – now 10 releases in and growing has seen output from Hannah herself alongside POSH the Prince, Jahcoozi, Mama and Bubba. BB released their first long player at the start of the year, which picked up plaudits far and wide. A hugely popular podcast has since given birth to Batty Bass Radio, recorded @ Red Bull studios and syndicated via Red Bull to over 15 million listeners worldwide. The batty beats brightly roll on! !